Your college dorm room decor doesn't have to be all serious and mature now that you're in college. Your dorm room decor can also have some humorous dorm wall art dorm items! Your college wall decor is all about displaying your interests and personality. And yes, that includes your sense of humor! 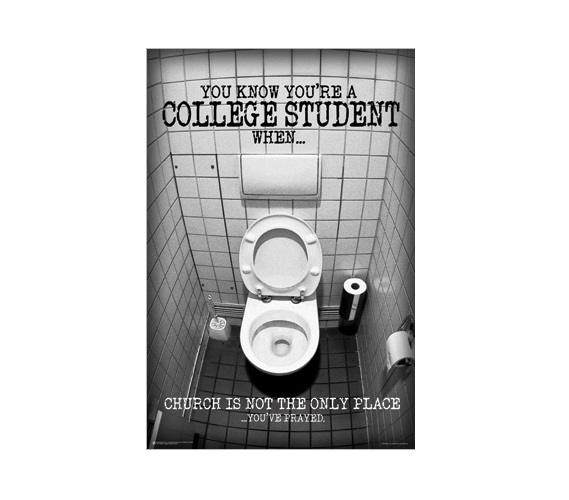 College can be a little bit stressful - make sure you have some dorm room decorations that make you smile and laugh like our College Student Prayed Dorm Room Poster. This dorm essentials item is sure to display your sense of humor. This college supplies dorm product features a photograph of a bathroom. That doesn't seem like it will add much to your college wall decor, but it's when you combine it with the quote that it makes your dorm necessities unique. This college supplies item takes a situation some college students may face and turns it into a funny situation and one that also adds to your dorm room decor!